The Professional Development Award for Graduate Students is supported by the Office of the Provost to help University of Delaware graduate students participate in significant professional conferences pertaining to their field of study. Conference travel is essential to the academic growth and development of graduate students. It affords opportunities for presentation of student work in a professional setting, as well as opportunities for networking and exposure to the latest academic research. We invite you to explore our world view and see where our students have been and where they are heading to next. This map was added 12-15-2015 and is a growing snapshot of our recent award recipients. Below is a sampling of the most recent award recipients. 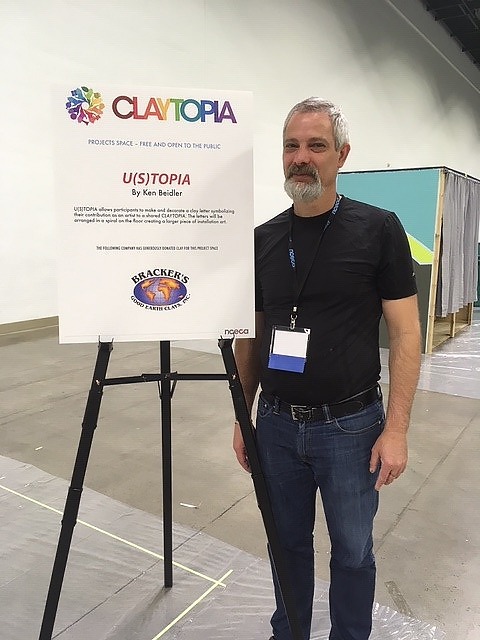 My presentation at the annual National Council on Education for the Ceramic Arts was entitled U(S)Topia. I lead an interactive clay workshop in which participants were invited to make a clay letter using the theme from the conference CLAYTOPIA. 101 youth and adults participated in the 9 hour workshop, decorating a letter and then adding it to a floor installation work at the conference. The activity was a skill building, peer-to-peer networking opportunity that highlighted the experiences of each participant and their unique contribution to the ceramic community. The workshop drew on my interest in my graduate work in using ceramic art as a medium for building networks and creating opportunities for peer-to-peer learning through artistic experiences. My role as a facilitator included preparing all the materials for the workshop, setting up the space and installation, assisting participants with the project, photographing and documenting the project as it was made and posting on social media. I gained valuable experience that I will utilize in planning future art installations that involve interaction with a variety of communities. I appreciate the opportunity to represent the University of Delaware at this important annual ceramics conference. With the support of the Office of Graduate and Professional Education, this past March I was able to travel to Rome to participate in a workshop on the history of photography entitled “Circulating Photographs: Materials, Practices, Institutions.” Hosted by the Bibliotheca Hertziana at the Max Planck Institute for Art History, this workshop brought together an international group of scholars to examine the circulation of photographs, and photographic knowledge, in Europe and America in the nineteenth and twentieth centuries. During this five-day course, we toured a number of photographic archives in Rome, including the Istituto Centrale per la Grafica, the Istituto Centrale per il Catalogo e la Documentazione, the British School, and the American Academy, and attended two public lectures. As part of the program, each participant was also required to present a case study that engaged with the themes of photographic circulation. Highlights included discussions of French colonial medical photography, Communist photomontage, and the circulation of Abraham Lincoln’s photograph via the five-dollar bill. For my presentation, I gave a 25-minute talk derived from my doctoral dissertation, which discussed the circulation of images of Civil War prisoners. These photographs, which were taken in Annapolis in 1864, circulated widely as 2 ½ x 4-inch card photographs known as cartes de visite, and later as wood engravings in the illustrated press. As an American photo historian, I benefited immensely from attending this program. I not only gained valuable experience in editing my work for an international audience, but also I was able to network and make friends with scholars from England, France, Germany, and Italy, who helped enhance my knowledge of photographic history. For example, I received feedback from a French scholar who encouraged me to think of my photographs more as Union propaganda, rather than medical records. I also greatly enjoyed getting to see all the amazing Italian art and architecture – and eating all the amazing Italian food! – when we weren’t in class. I am very grateful to the Office of Graduate and Professional Education for having supported my trip to Rome, as it was truly the opportunity of a lifetime! To date 998 graduate students have received funding from UD's Graduate and Professional Education to pursue professional development.